This topic describes how to directly access files in Lumberyard for special use cases. However, it's recommended that you use the Lumberyard Asset system to work with asset files. In most cases, raw file access is not required. For more information see Working with the Asset Pipeline and Asset Files. Loading raw configuration files from the deployment root during startup before .pak files are mounted and available. Direct access to the files in a .pak file. Direct access to files at arbitrary locations on disk. Streaming file formats (for example, audio or video) that do not load the entire file but play it back. This approach commonly uses middleware to play back or capture audio, video, or vertex data. Most such systems require that you implement file hooks to perform operations like read, seek, tell, open, and close. In these cases, direct file access might be easier than treating the files as assets and performing operations on them with AZ::Data systems. Other legacy systems or middleware that require direct file access for which AZ::DataAsset systems cannot be used. However, note that it is possible to write a file access shim that describes how to access files for most middleware. Loading raw source files from locations other than the asset cache. Loading source files from locations other than the asset cache is possible only for tools inside Lumberyard Editor. Only the asset cache ships with your game, so loading raw source files from locations other than the asset cache at run time is not possible. The few cases where you need to work directly with files are covered by a small number of classes in the AZ::IO namespace such as FileIOBase and FileIOStream. static FileIOBase* GetInstance();  ///< Use this to get a concrete instance of the API that follows. The FileIOBase class contains operations to find files, create or delete directories, and inspect attributes. In addition, the class contains a directory aliasing system that is covered later in this document. All file operations in the FileIOBase class are blocking. FileIOBase file operations behave similarly to the C language API fopen, fread, and fclose operations, but are 64-bit aware and work with very large files. Because the FileIOBase instance is created and initialized when the engine initializes, it is generally always available. It can inspect .pak files and arbitrary files on disk. 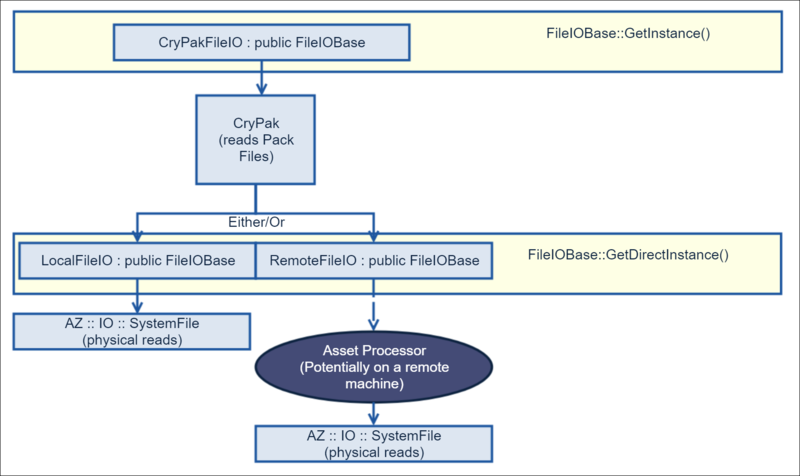 For more information, see The FileIO Stack later in this document. Because .pak files are initialized only after the application boots, attempting to access data inside .pak files before they are mounted will fail. For more information, see the code comments in the FileIO.h file. In addition to a set of file functions mentioned above, the FileIOBase class provides directory aliases. Directory aliases are prefixes that you add to a file name. An alias indicates a virtual directory for a .pak file or arbitrary location on disk. We recommend that you always use the aliasing system to refer to files that are in the cache. Never use absolute paths. Files in the cache might be inside .pak files or in unexpected locations on mobile devices. In these cases, the use of absolute path names can fail. To retrieve the path associated with an alias, use the GetAlias function. This section describes the use of directory aliases. Because @assets@ is the default alias, code can simply load files by name (for example, textures\MyTexture.dds) without using the asset system. This makes it unnecessary to have the @assets@ alias appear throughout the code. If you are loading files from the asset cache, do not prefix your file names with the @assets@ alias. The use of aliases is required only when you must alter the default behavior. This best practice makes your code easier to read and enhances compatibility. During development on a PC, @assets@ points to the dev\Cache\<game_name>\pc\<game_name> directory. After release, it points to the directory where your .pak files are stored (not the root of your cache where your configuration files are stored). Because the asset cache can be locked by asset processing operations, attempting to write to the asset cache can cause an assertion fail. Do not attempt to write files to the asset cache. The asset cache @assets@ can be a child directory of @root@, but that is not always the case. Therefore, do not make this assumption. If you want to load a root file, use @root@. If you want to load assets, either use no alias (because @assets@ is the default), or use @assets@. During development, the @root@ directory maps to your dev\Cache\<game_name>\pc directory. In release, this directory is the root directory of your game distribution (where the bootstrap.cfg file is stored). Attempting to write to the @assets@ location causes an assertion fail. You should change these files in your source dev\ directory, not in the cache. It is not expected that the user will delete this directory. On a PC, @user@ is the dev\Cache\<game_name>\pc\user directory. On other operating systems and devices, the @user@ location can be different. Some mobile operating systems have restrictions on where applications can write files. Specifies a writable directory for storing temporary data. The user can delete this data at any time. Specifies a writable directory for storing diagnostic logs. A. The following code example opens a file in the assets directory. // Because @assets@\config\myfile.xml is desired, an alias doesn't have to be specified. // Open succeeded. Use other API operations of FileIOBase to perform operations with the handle. Remember to close the file! Note that because aliases are used in the preceding example, the config\myfile.xml file would be found even if it is inside a .pak file. B. The following code example opens a file in the log directory and appends log lines to it. // so the file name must be specified. // Because you're writing a file to a non-@assets@ directory, it can contain case. // Open succeeded. Use other API operations of FileIOBase to perform operations with the handle. The FileIOStream class in the AZ::IO namespace automatically closes a file when it goes out of scope and presents it as a GenericStream interface. This provides compatibility for systems such as the streamer system and serialization system that expect generic streams. The following aliases are applicable only for editor tools. Specifies the \dev\ directory of your source tree where files like bootstrap.cfg are located. These files are consumed by the Asset Processor and deployed into the cache specified by @root@. @devassets@ is a good starting point for a file open dialog that asks a user where to save a new file. Because existing files might be in a gem, do not save them in @devassets@. Instead, when your editor opens a file, have your editor remember the file's location. Then have the editor save the file to the file's original location. Because not all source files are located in @devassets@ (many are located in gems), do not attempt to find all source files by searching its location. To service the needs of the game client and tools, more than one FileIO instance is created. These instances form a stack through which file requests flow, as the following diagram illustrates. The behavior of the Either/Or branch depends on whether the virtual file system (VFS) feature (RemoteFileIO in the diagram) is enabled. VFS reads assets remotely from non-PC devices such as Android and iOS. VFS is required for live reloading of assets. Otherwise, assets would need to be deployed directly onto game devices. VFS is disabled by default. To enable VFS, edit the remote_filesystem entry of the \dev\bootstrap.cfg configuration file, as in the following example. Because the VFS feature is at a low level, file access operations are transmitted transparently over the network through the Asset Processor to the layers above. To send requests for files through other systems, you can implement your own version of FileIOBase (or one of the derived classes such as RemoteFileIO or LocalFileIO). If you replace the instance returned by either GetInstance or GetDirectinstance with your own instance, the FileIO system uses your layer instead. You can form a stack of additional filters by replacing the instance with your own. Then make your own instance call down into the previously installed instance. If you want to use asynchronous background streaming, consider using the AZ::IO::Streamer class instead of FileIOBase. The Streamer class uses FileIOBase internally, but it uses asynchronous semantics. To use the Streamer class, you pass data and a deadline to it. The Streamer class puts the data into a buffer and does its best to fulfill the request before the specified deadline. For more information, see the code and comments in the \dev\Code\Framework\AzCore\AzCore\IO\Streamer.h file.